Kansas City Royals celebrates their 4-3 win against the Toronto Blue Jays in Game 6 of baseball's American League Championship Series on Friday, Oct. 23, 2015, in Kansas City, Mo. Lorenzo Cain raced in from the outfield about as fast as he had raced around the bases, hurrying to join the rest of the Kansas City Royals as they streamed onto the diamond in celebration. "We came in with one goal," Cain said with a smile, "and that was to get back." 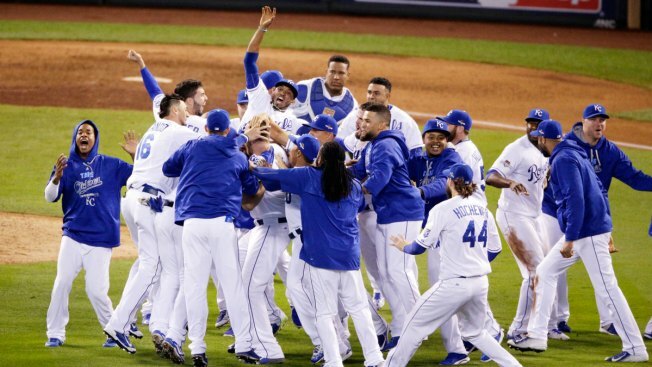 "Our guys, from the first day of spring training, their focus was to get back to the World Series," Royals manager Ned Yost said, "and they did it." "I felt like I cut it off quick enough to where if I threw to second I could prevent him from going to second and Cain from scoring," Bautista said, "but I was wrong." "As soon I saw him release the ball to second," Jirschele said, "I had Lorenzo coming in." "At that point, it was about as bad as it could get, a man on third with no outs," Davis said. "Just hoping for some magic and get out of it." "They made a run at it," Toronto manager John Gibbons said. "I really couldn't be more proud of our guys. They laid it out every day. They're great competitors and a fun bunch." Madson allowed a leadoff single to Revere, and then struck out Donaldson, before peering in at Bautista in the box. The home run hitter who irked Kansas City fans all series followed his solo shot in the first inning with a tying, two-run homer to left that silenced the crowd — other than the smattering of boos directed at Madson on the mound. "The story just keeps better and better," Hosmer said. "I can't waiting to be fighting on the big stage with these guys in a couple of days."